French wood-engraving, title page of La Lune, 20th October 1867. Philippe Ricord (1800-1889) was a French physician. He specialized in venereal diseases. Doctor Ricord was surgeon in chief to the hospital for venereal diseases and to the Hospital du Miti. He won a worldwide reputation in his special field. For his suggestions on the cure of varicocele and on the operation of urethroplasty he received in 1842 one of the Montyon prizes. Andre Gill was a French caricaturist. Born Louis-Alexandre Gosset de Guines at Paris,, he studied at this city's Academy of Fine Arts. He adopted the pseudonym Andre Gill in homage to his hero, James Gillray. Gill began illustrating for Le Journal Amusant. 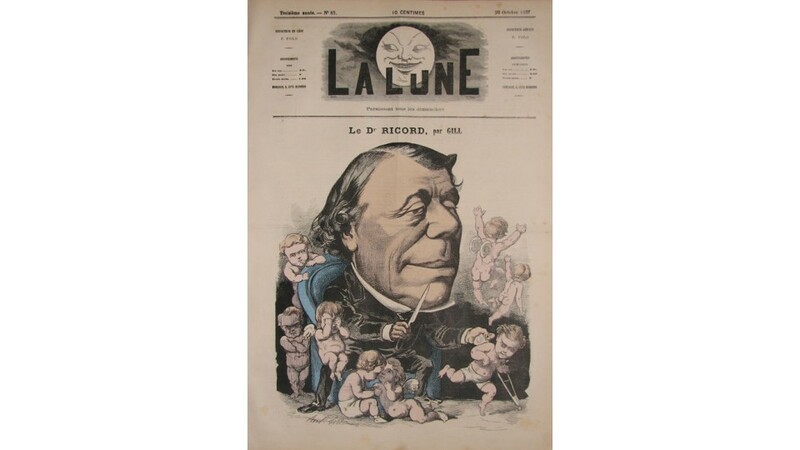 Gill, however, became known for his work for the weekly four-sheet newspaper La Lune, edited by Francis Polo, in which he drew portraits for a series entitled The Man of the Day. 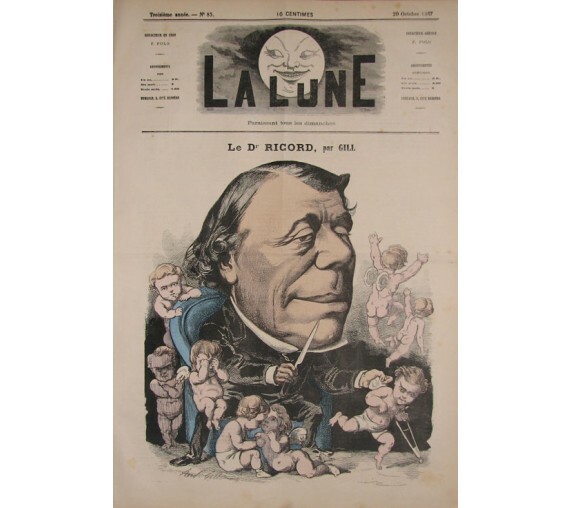 He worked for La Lune from 1865 to 1868. 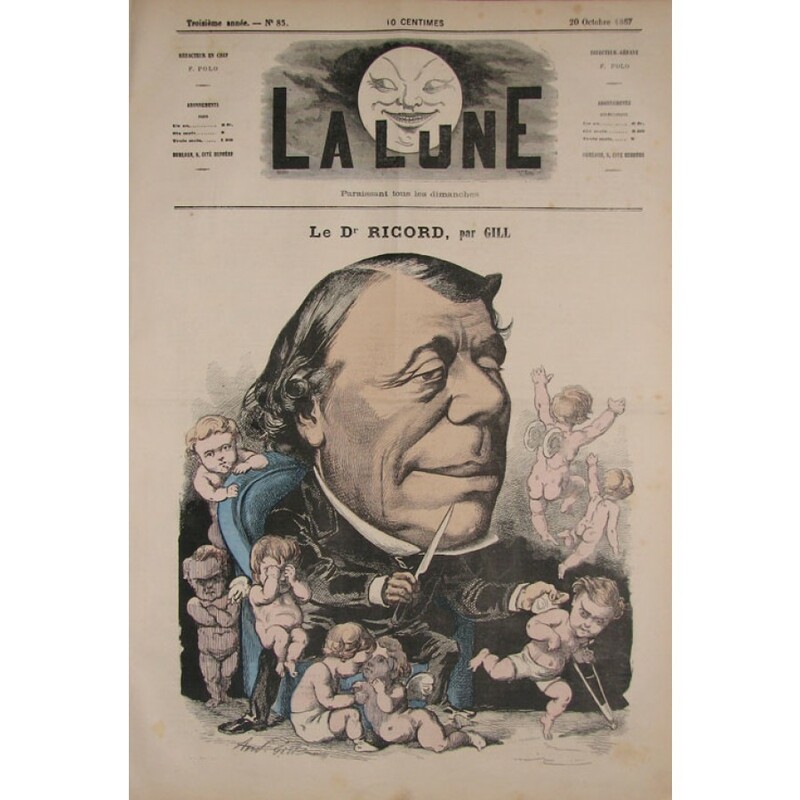 When La Lune was banned, he worked for the periodical L'Eclipse from 1868 to 1876. Gill also drew for famous periodical Le Charivari. Gill's style, subsequently much imitated, was noted for the enlargement of his subjects' heads, which sat upon undersized bodies. 2 folds as issued.